London – Outstanding horses Roaring Lion, Cracksman, Crystal Ocean and Capri are among 14 entries for the QIPCO Champion Stakes at Ascot on Saturday. 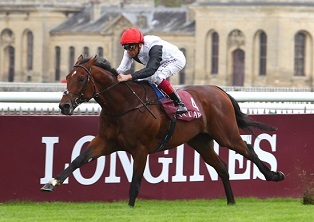 Cracksman evoked memories of his sire Frankel when a dazzling seven-length winner of the race 12 months ago and has added two more Group 1 victories to his CV this term – the Prix Ganay at ParisLongchamp and Investec Coronation Cup at Epsom. On his other start this term, he chased home Poet’s Word in the Prince of Wales’s Stakes at Royal Ascot. Roaring Lion has thrived this year and has shown 2000m to be his optimum trip on his past three starts – reeling off successive Group 1 wins in the Coral-Eclipse, Juddmonte International Stakes and QIPCO Irish Champion Stakes. The grey also won the Group 2 Betfred Dante Stakes at York in May, in between finishing fifth in the 2000 Guineas and third in the Investec Derby. Gosden has other potential strings to his bow in Monarchs Glen, absent since winning the Wolferton Stakes at Royal Ascot and Maverick Wave. Sir Michael Stoute has yet to enjoy a winner on QIPCO British Champions Day and will be hoping to change that with either Mirage Dancer or Crystal Ocean. The latter won the Hardwicke Stakes at the Royal Meeting before being touched off by Poet’s Word, his stablemate, in a compelling King George VI and Queen Elizabeth Stakes. On his latest start, he again had to settle for second, finding a concession of 4kg to Enable too much to handle in the September Stakes at Kempton. Capri was a close fifth to Enable in this month’s Qatar Prix de l’Arc de Triomphe, having won the Irish Derby and St Leger last season. He is among five Aidan O’Brien-trained representatives. Connections have supplemented Laurens for the meeting’s Queen Elizabeth II Stakes – at a cost of £70,000. Karl Burke’s charge has enjoyed a tremendous campaign, winning four Group 1 races this season, and booked her place in the weekend field when working well under PJ McDonald on Sunday. McDonald fractured his left ankle and right heel after being thrown from a horse in the paddock at Newcastle on 3 September and has not ridden in a race since. He is set to return to action, back at Newcastle, on Wednesday. Happily, beaten a head by Laurens in the Sun Chariot Stakes at Newmarket last time, is set to reoppose. Roaring Lion might contest this race rather than the Champion Stakes and a decision will be taken on Thursday morning after connections have walked the course. French-trained horses have won two of the past four renewals of and plenty will fancy Recoletos to improve that tally. Trained by Carlos Laffon-Parias in Chantilly, the four-year-old finished fourth to Cracksman in the Champion Stakes last year but has proven an even greater force back in distance this year. Stradivarius has been flawless this season and heads 10 entries for the Long Distance Cup, the first race on the Champions Day card. The four-year-old’s successive wins in the Yorkshire Cup, Gold Cup, Goodwood Cup and Lonsdale Cup earned his connections a £1-million bonus offered by Weatherbys Hamilton. Bred and owned by Bjorn Nielsen, Stradivarius was a close third in the Long Distance Cup last year and is unbeaten since. If Stradivarius caps a perfect campaign then the John Gosden-trained colt will become only the second horse to have won five races that fall under the QIPCO British Champions Series umbrella in the same season. The mighty Frankel achieved the feat in 2012. As expected, O’Brien’s Flag Of Honour, winner of the Irish St Leger, has been supplemented. He has thrived since being upped in distance and on his latest start made all for Classic glory at the Curragh.